Gender, Fear, and Politic: “The Left Hand of Darkness” by Ursula K. Le Guin | J.W. Wartick -"Always Have a Reason"
The Left Hand of Darkness has come to be considered one of the greatest works of science fiction. The book portrays the efforts of an ethnologist, Genly Ai, makes to try to unite the people of the planet of Winter with the Ekumen of Known Worlds. What happens in his efforts will be explored thematically in what follows. There will be SPOILERS in what follows. 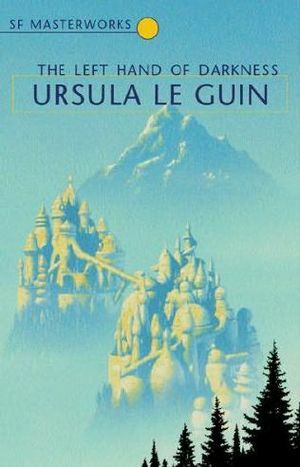 Le Guin has come to be known as a major innovator in science fiction by putting forth feminist ideas in the form of novels. In The Left Hand of Darkness, Winter is populated by humans who have genetically been modified to be essentially genderless. But it goes beyond that, because in each monthly cycle, people become either male or female during a time of fertility, and then become effectively “neuter” again. I suppose the most important thing… is whether one’s born male or female. In most societies it determines one’s expectations, activities, outlook, ethics, manners–almost everything… (252-253). Ultimately, Genly admits defeat in attempting to explain what women are like. He says they are “more alien” to him than the aliens of Winter (253). But Genly, in his own mind, has much to think about women. He often thinks of women as submissive, foolish, and perhaps a little weak. They are tied down through childrearing while men are to be dominant in society. Genly’s own thoughts on the topic serve as a foil for the reader’s thoughts about gender. By placing the reader in Genly’s mind, and seeing the absurdity of his views of gender lined up against an effectively genderless (or potentially gendered?) society, one is forced to consider one’s own views of gender and the power structures which may accompany it. Jarringly, the inhabitants of Winter are always referred to with male pronouns. The reason is explained at one point as having to assign the Gethenians (those inhabitants) some pronoun to use. But the fact is that the Gethenians may be both the mother of some children and the father of others due to the way their procreative cycle works. One is forced to wonder at the wisdom of using the male pronoun for such persons. We’ll consider the implications of this below, but for now it is merely important to see the dialogue happening within the story. What are your views of gender? How do they impact your view of the “other”? Once again we see the recurring theme that the “Other” is to be feared and fought against. Whether that “Other” is a gendered other or an alien or simply someone from a different country, The Left Hand of Darkness forces readers to consider their own fears. How might one’s own feelings about the “Other”s in their own society shape their interactions with them? The line quoted at the beginning of this post is echoed throughout the book: truth is what we make of it. We may choose a reality. But Le Guin’s portrayal of truth goes beyond relativism. Instead, truth matters in the telling. “Facts are no more solid, coherent, round, and real than pearls are. But both are sensitive” (1). Thus, lies may come across as true or believable due to how they’re told, and they may “become true.” Of course, this means not that reality itself changes, but rather that one’s interaction with truth or falsehood may itself determine one’s belief in either one. The Left Hand of Darkness is steeped in critical theory. Le Guin’s discussion of gender is perhaps the most obvious point of this: readers are forced to consider their own ways of thinking about male/female dichotomy through the eyes of a man who is struggling to force his categories onto beings which do not neatly fit into either bucket. Some may immediately critique Le Guin and suggest she is trying to blur gender lines and do away with any distinction between man and woman. That may well be what she was doing (I don’t know), but that should not prevent readers from acknowledging they have their own biases about what genders are or how male/female should act (or not?). The novel forces introspection and reflection. Similarly, how does one’s view of the “Other”–whether made other by gender, country, kin, or belief–get shaped by one’s own presuppositions about what that “Other” should be? Here are dynamics of power, politic, and fear. The Left Hand of Darkness is a highly reflective novel. By integrating literary criticism and critical theory into her fiction, Le Guin forces readers to examine their own views. Whether one agrees with the various aspects of feminist thought Le Guin includes in the work, one will consider these aspects with new light through the reading of the novel. Ursula K. Le Guin, The Left Hand of Darkness (New York: Ace, 2010). Originally published by Ace in 1969.